One of the most frequently used – but least understood – terms used in our industry is “tune-up”. A few decades ago, vehicles required frequent mechanical tuning to keep them operating optimally. Over time, “tune-up” became a common way of saying “make my car run better”. In today’s electronically-controlled vehicles, however, a tune-up is very different. Many of the mechanical adjustments we made in older cars are now made by your vehicle’s onboard computer. So when we talk about a tune-up at Lowell’s, we mean changing your vehicle’s spark plugs and, when appropriate, your fuel filter and engine air filter. A spark plug converts an incoming electrical charge into a spark which ignites the mixture of air and fuel that powers your car’s engine. The spark jumps between two electrodes at the end of the plug, creating the controlled explosion that drives an internal combustion engine. Spark plugs can wear out. Each spark burns off tiny bits of metal on the electrodes, and after hundreds of millions of sparks, the spark plug doesn’t fire as efficiently. 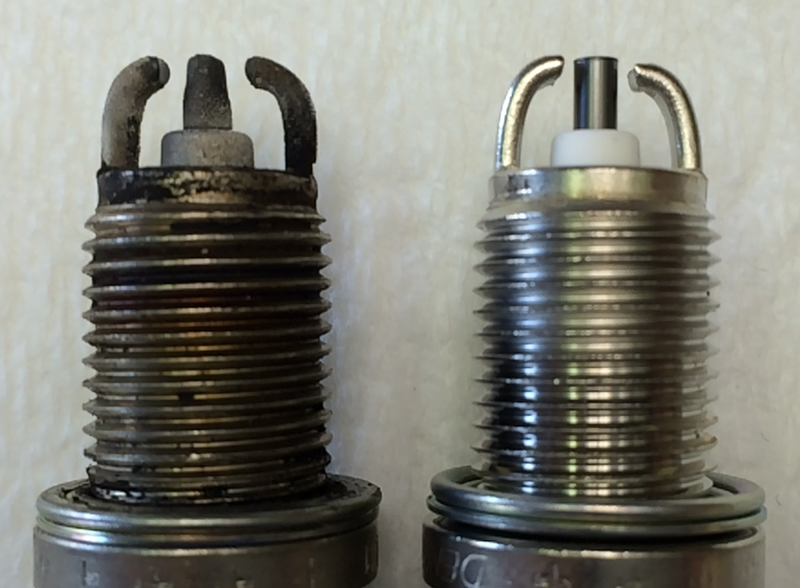 Spark plugs can also become coated with residue (‘fouled’) if your fuel doesn’t burn cleanly. The electrodes for Toyota plugs (made by Denso) are plated with different highly conductive metals: nickel, platinum, or iridium. The type of metal used determines how long the spark plug lasts: Nickel-plated spark plugs typically last for 30,000 miles; Platinum for 60,000; and Iridium for 120,000 miles. When we do a tune-up at Lowell’s, we remove and inspect your old spark plugs to see whether there are any issues other than normal wear. We replace them with new spark plugs, adjusting the gap between electrodes when necessary. If needed, we’ll also replace the fuel filter and engine air filter. Feel free to call the shop with any questions, and – if it is time for a tune-up or other service for your vehicle – to make an appointment for service.